AerCap Holdings NV engages in aircraft leasing and aviation finance. It acquires new or used commercial aircrafts and lends them to its clients via operating leases. It also provides aircraft owners, financiers and investors with asset services to manage an aircraft portfolio. It operates through the Leasing, Financing, Sales, and Management of Commercial Aircraft and Engines segment. The company was founded in 1995 and is headquartered in Dublin, Ireland. Hab mir paar Stücke zugelegt. 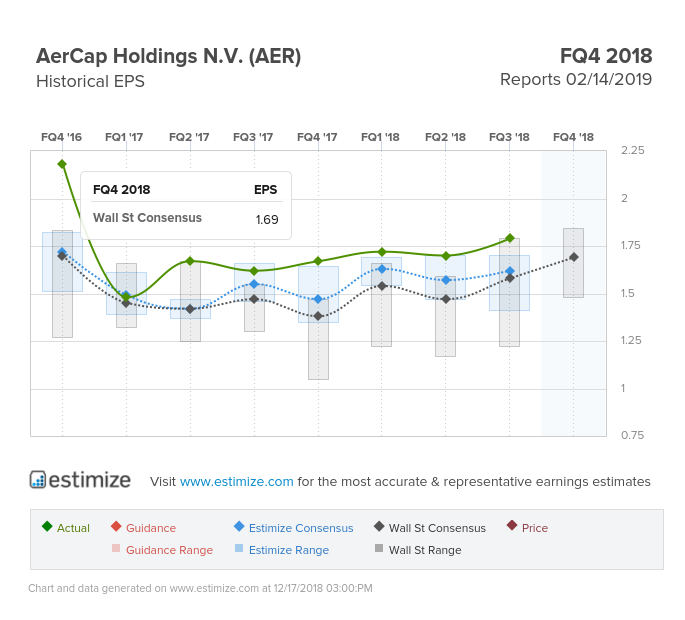 AerCap's second quarter 2018 earnings press release will be released before financial markets open in the United States on July 30, 2018. A copy of the press release will be posted on the "Investors" section of AerCap's website at www.aercap.com. At the same time, the presentation slides for the conference call will also be posted on AerCap's website. Barclays PLC to $69.00. overweight rating. nach den sehr guten Zahlen werden wahrscheinlich Höherbewertungen folgen. derzeit wird keine Dividende gezahlt, würde nur 1/2 des Gewinns ausgeschüttet, würde die Rendite 6.7% betragen. Risiko; Fliegerei ist gefährlich, da man sich in der Luft befindet. denke, die Vorstellung könnte positive Kurswirkung zeigen. alles scheint perfekt zu laufen. Auch sind weiter Aktienrückkäufe eingeplant. On October 29, 2018, our Board of Directors approved a new share repurchase program authorizing total repurchases of up to $200 million of AerCap ordinary shares through March 31, 2019. Geldaufnahme (warum in Dollar und nicht im zinsgünstigeren € ?